The weekend before Christmas, volunteers from the El Dorado County Sheriff's Office, Explorers, STARs, Placerville CHP, Police Department, Kiwanis, EDCOE, and school districts sorted more than 20,000 toys and created a massive Santa's Workshop for more than 1,000 families in need. 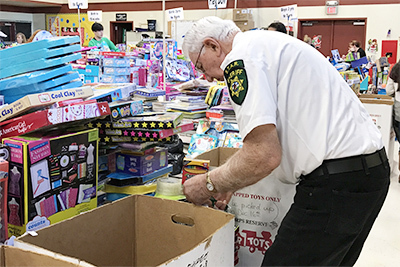 Toys were collected in large Toys for Tots bins placed throughout the County, and generous community members filled them to the brim with new toys for all ages. This collaborative effort ensured that thousands of children will wake up Christmas morning with presents that they may not have received otherwise. The U. S. Marine Corps Reserve Toys for Tots Program is directed by the Commander, Marine Forces Reserve, with the assistance of his staff, from the Marine Forces Reserve Headquarters in New Orleans, Louisiana. The Foundation provides the funding and support needed for successful annual toy collection and distribution campaigns. Local campaigns are conducted annually in over 700 communities covering all 50 states, the District of Columbia and Puerto Rico. Local toy collection campaigns begin in October and last until mid to late December. Members of the community drop new, unwrapped toys in collection boxes positioned in local businesses, schools, and community organizations. Coordinators pick up the toys and store them in central warehouses where the toys are sorted by age and gender. Parents completed forms and submitted them to their schools for collection at EDCOE, prior to the weekend before Christmas. Families received a date and time to visit Santa’s Workshop to select toys for their children. For more information about the Toys for Tots Program.